With the release of The Force Awakens almost upon us, many will be looking to Return of the Jedi to see where exactly it leaves off for the future films to pick up from. After all, what was once seen as the ultimate finishing point of the entire saga is now setting things up for the next line of stories in the Star Wars timeline – and, if we’re at all fortunate, they will lead to a slightly more satisfying climax than the one we originally got thirty-two years ago. The final film in the original trilogy, this time directed by the late Richard Marquand and with both George Lucas and Lawrence Kasdan returning as co-writers, is probably the silliest out of the entire six-film saga, and given what we’ve seen in the other movies that’s saying a lot. By no means is it terrible or even the worst – we have Attack of the Clones for that – but dramatically it isn’t as strong as The Empire Strikes Back nor is it as simple as A New Hope; it seems to take itself slightly less seriously than the others, which is fair enough but when it’s meant to be wrapping up several storylines and character arcs that have transpired over the course of the three films, you want something that’s more satisfying than what we actually got. Sure, there’s battles in space and on strange new worlds (as well as some old ones), but they’re either not given the right amount of focus or just end up looking too silly for their own good. The latter particularly applies to the Battle of Endor and that army of dead-eyed teddy-bears known professionally as Ewoks; it’s savage and honestly quite brutal at points, but when you really look at the bigger picture it’s just a bunch of cuddly teddy bears killing Stormtroopers with rocks and spears. Yeah, it’s pretty damn silly. On that note, we should probably mention that we don’t have as big a problem with the Ewoks as many other people do – sure, they’re obviously there to be paraded for endless merchandising opportunities (including, of all things, a short-lived cartoon series), but they’re really not as annoying as they could have been, ESPECIALLY when you compare them to what Lucas would unleash upon the world later on (you know exactly who we’re talking about…). We’d say the biggest problem we have with them is that, next to everything else, they’re wildly out of place; they look like they belong in a completely different movie, one aimed much more at children, instead of a grand space opera like Star Wars that’s meant for a much wider audience. Their presence is clearly just to sell more toys, but to their credit they’re not as awful as they could have been (take note, Gungans!). Anyway, back to the film; the silliness of the whole thing does slightly undermine the more serious moments that the film tries to convey, whether they’re focusing on the inner struggle within Luke (Mark Hamill) to confront and possibly kill his father Darth Vader (played physically by David Prowse, vocally by James Earl Jones), or the on-screen deaths of certain fan-favourites. It’s a shame, because most of these are well thought-out scenes, but they also come mere moments after we’ve seen giant slug monsters being choked to death by Princess Leia (Carrie Fisher) in that infamous bikini, or little teddy-bear creatures worshipping a golden robot as a God, or walking shrimp aliens shouting the GIF-able phrase “it’s a trap!”. Yes, the mixture of silliness and seriousness has been the crux of Star Wars from the very beginning, but here it doesn’t feel evened out enough and it’s more silly than it needs to be, especially for what was originally supposed to be the finale of this grand saga. 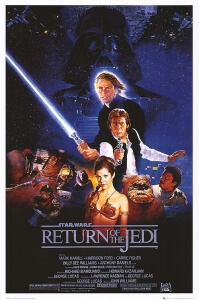 Return of the Jedi is probably the silliest of the original trilogy, which can sometimes be a problem as it tries to wrap up several storylines at once, some of them not so satisfyingly, but it also makes for some fine entertainment regardless.